We caught up with The National guitarist Bryce Dessner by phone last week as he was strolling around Paris. 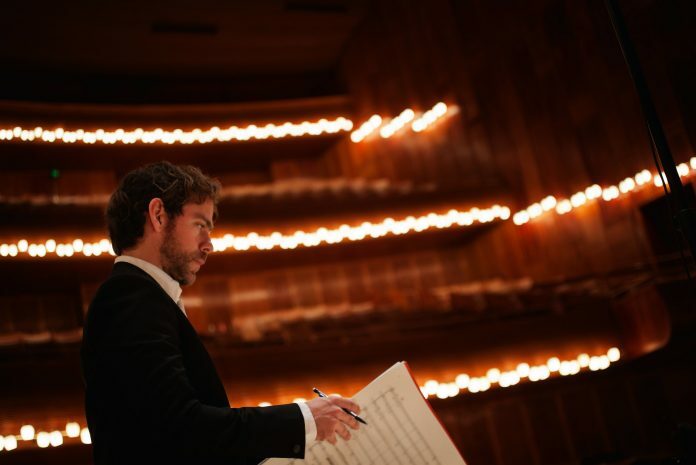 Dessner was putting finishing touches on this year’s edition of the MusicNOW Festival, which takes place March 21-22 at Music Hall and features Will Oldham, the Cincinnati Symphony Orchestra, Nico Muhly, Aaron Dessner, eighth blackbird and more. This will be the ninth MusicNOW. At this point, what does the festival mean to you as its founder and artistic director? I’ve kind of grown up with it. In a way, MusicNOW started as a lab or residency of artists interested in doing collaborative work. It was and is kind of homemade and organic, and personally it is an antidote to the large rock festivals I play in the summer with The National–Glastonbury, Coachella and the rest. What started as an artistic project has now become a nice way for me to come home and connect with family and friends. It’s a labor of love and something I’m very proud of. What’s changed is that since the time it began, a lot of the artists I have used who were unknown have moved on to larger spaces—I mean, look at Justin Vernon of Bon Iver. He has won multiple Grammys and can sell out the Taft Theatre. But we’re still committed to presenting upcoming artists. This year’s festival is the first of its kind, a collaboration with the Cincinnati Symphony Orchestra. After eight years of presenting my own personal choices I wanted this to be a collaboration with Louis Langrée. He’s just a very brilliant, very open person, one of these people that just have a radiance about them. He’s a really inspiring guy. Is there a particular highlight you want to mention? David Lang is presenting a commissioned work. David Lang is probably my favorite American composer and has been a big mentor to me. He’s a very in demand composer, he’s had a residency at Carnegie Hall and won the Pulitzer Prize. On March 21 there is a performance of your guitar concerto, St. Carolyn and the Sea. A recording of it has just been released on Deutsche Grammophon, paired with a composition from Radiohead guitarist Jonny Greenwood (Greenwood’s music will be performed by the CSO March 22). As another guitarist who has strayed well past the bounds of rock music, do you feel a kinship with Greenwood? I think so. We’re maybe emblematic of a generation of musicians with a diversity of education. Are they rock musicians? Are they classical musicians? It’s hard to say. Sometimes those definitions oversimplify things. Today with the influence of the Internet and the dissolution of major labels, it’s become a good time to be a composer pushing yourself to create new sounds and forms. Is Cincinnati a welcoming place for new sounds and forms? Yes and no. It’s not New York, with a long tradition of avant-garde experimental music. But it has one of the best symphony orchestras in the country, one with a history of playing important commissioned works. And I think CSO has a chance with its new director to lead, to carve out a space for this fluid and living orchestral music.